Those seeking authentic Mexican dishes have a new local option at Sol Azteca. Sol Azteca Mexican Kitchen opened in early July at the corner of Ellsworth and Baseline next to the SodaCrush. 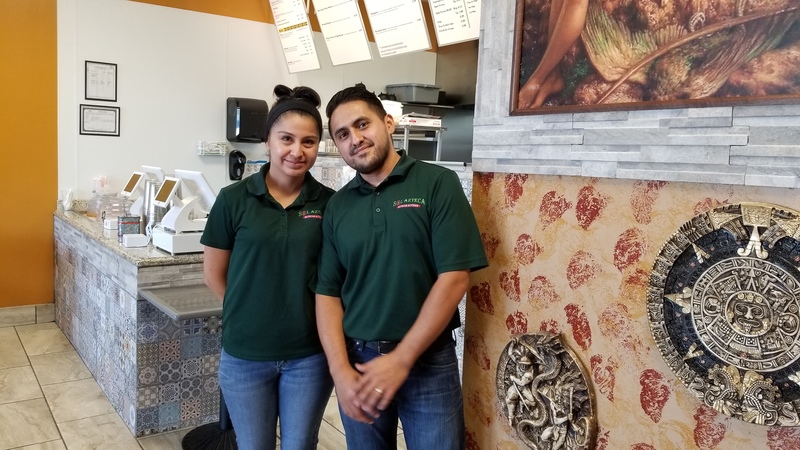 Owners Ivan and Violet Garrido and their family saw an opportunity to bring back the flavors of Mexico in the East Valley. The Garridos have both worked in the food service industry since they were teens and were excited to open a place of their own where they could showcase their combined family recipes to create true authentic Mexican dishes. are made locally everyday and the Garridos are continuing to seek out additional local suppliers. cactus, and topped with grilled onions, queso fresco, and a molcajete salsa. steak plus a cheese enchilada with pico, fresh guacamole, and sour cream. Sol Azteca also offers street tacos including carne asada, grilled chicken, carnitas, and al pastor. Al pastor is a mouthwatering, seasoned pork with pineapple popular with street taco vendors in Mexico. Sol Azteca also offers seafood tacos. There are quite a few breakfast options, including breakfast burritos, huevos rancheros, chorizo, and machaca. On Saturday’s you can receive a free dessert with the purchase of a kids meal. The offer caramel flan and Tres Leches cake which are both made on site. Free balloons will be provided for children.